Hey all! I know this forum is kind of dead but I was looking for some help renovating our current XC course. It was built in the 90s and everything is completly solid, telephone poles, hard wood, tires, stones, etc. We have been trying to get a USEA regulation course so that we can have USEA recognized events, but we've since been told that our course is too difficult and our fences XC feces can't be completely solid anymore. We would prefer to just modify the current jumps rather than build completely new ones, due to our lack of monetary funds! Does anyone have ideas on how to create more breakaway style jumps, or can someone explain the ruling a little better? Are there only certain levels it needs to be breakaway or what? 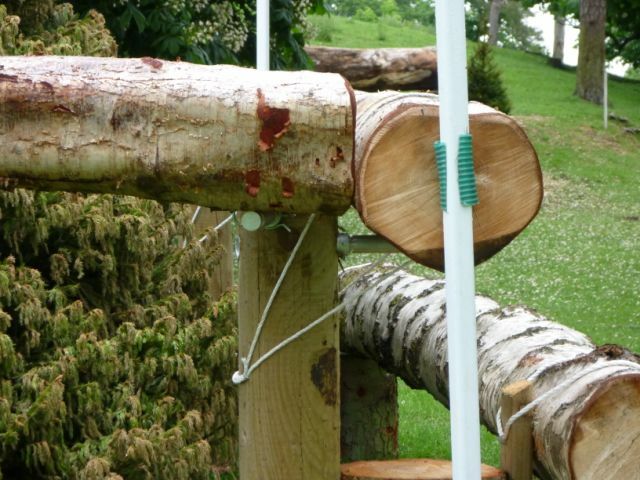 Our fences range from Starter-Novice, so they aren't that big but we would like to be able to at least open our course for schooling for those at that level since we do have a large Pony Club and 4-H population in our area that are riding at these levels. Thanks for any advice you can offer! Most of my xcountry fences are solid as well but an idea might be like a telephone resting inside of a dip. It'd still be solid but would come down if hit harde enough. I've always thought the point of xcountry was solid fences and the ones I saw at the 2010 WEGs looked solid. Sorry I couldn't be of any more help. They look solid untill hit hard and made to fall away. I think some of the jumps were made of very stiff stryafoam type stuff to. I think some of the jumps were made of very stiff stryafoam type stuff to. Most of the jumps are built of solid material (logs, telephone poles, stone, etc). The key is frangible pins on certain types of fences (open oxers, hanging logs, corners, etc). I'm betting you don't utilize those? not really. The fences we have at my barn are like 3 feet tops. They are basic fences and i guess that there are a few like log pyramids and such that if hit hard enough would come down. I've never really schooled xcountry above 3'6" and most of those from looking at when I walk the course dont look like they have any pins, and if they do they are well hidden. Where would they put these pins? USEA requires them for use in certain elements of a regulated course (open oxers, open corners, etc). question though. from the picture it looks like you would probably take it from right to left. The pole on the right side if it was hit wouldnt fall because of the pole behind it. Is this one with a hook in case the horse gets stuck in the middle of it? That pin doesn't hold the log in place like a jump cup does, when hit it will break/come out and cause the log to drop straight downwards. Notice that the logs are also secured with rope -- aiding them in dropping straight down and not rolling away from the jump.